A couple of summers ago when we were visiting Montana, we had the pleasure of visiting the C.M. Russell Museum in Great Falls. This wonderful facility showcases the work of America’s famous “Cowboy Artist,” Charles M. Russell, who stands shoulder-to-shoulder with Frederic Remington as the premier artist of the Old West. At the museum, you can see hundreds of Russell’s paintings, sculptures, and drawings, view the log studio where he painted many of his most famous works, and tour the home he shared with his wife Nancy for decades prior to his death in 1926. Russell’s work is full of the grandeur and pageantry of the western landscape, but he always adds some extra touch of drama, humor, and humanity that sets his work apart from the rest. He depicted Lewis and Clark a number of times, most famously in Lewis and Clark Meeting the Flatheads at Ross’s Hole, an epic-sized masterpiece that graces the House of Representatives in Montana’s beautiful capitol building in Helena. The painting depicts the September 4, 1805, meeting of the Corps of Discovery and a contingent of Salish (or Flathead) people. Despite the painting’s title, Lewis and Clark are a sideshow next to the wild beauty of the Indians, the mountains, and the prairie around them. They stand in the background to the right, with Sacagawea, watching their interpreter, Toby, use sign language to communicate with the Salish chief as a large skull-like cloud floats overhead. It was Russell’s not-so-subtle way of reminding the powers that be in Montana that their land had once belonged to somebody else. While visiting the museum, we picked up a great biography of Russell, Charles M. Russell: The Life and Legend of America’s Cowboy Artist by John Taliaferro. Taliaferro does a great job of separating fact from legend in his well-written, engaging account of Charlie’s life. 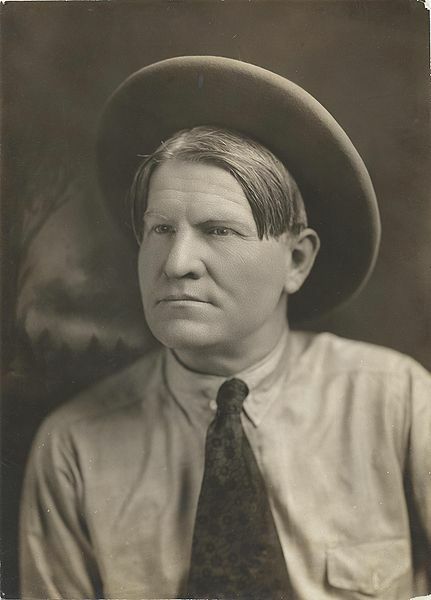 Russell wasn’t above embellishing his western credentials (he never, in fact, lived with the Indians, as he once claimed), but he did have genuine cowboy credentials, cutting his chops over years of nighthawking on the Montana range. Taliaferro is particularly fair to Russell’s wife, Nancy, who was often vilified by Russell’s friends for being money-hungry and status-conscious. Nancy was a self-made, self-educated woman who came from dirt-poor circumstances; she took on the sole responsibility for managing her lackadaisical cowboy husband’s art career. Nancy may have made a few enemies over the years, but she deserves credit for taking Charlie from being a scribbler who sold his drawings for $25 to a world-renowned artist earning thousands of dollars in commissions. Originally from St. Louis, Russell grew up hearing stories about his great grandfather, Silas Bent, who witnessed the Expedition’s return in 1806 and knew both Lewis and Clark. Russell must have found the Expedition a fascinating subject. 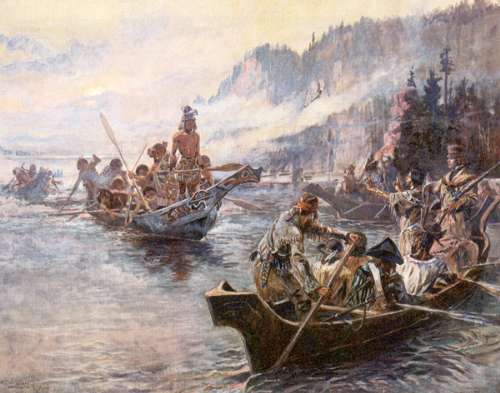 Though Lewis and Clark Meeting the Flatheads is undoubtedly his masterpiece, he created about twenty artworks of the Corps of Discovery during his lifetime. Here are some favorites. In the spring of 1805, high above the Missouri River, this painting portrays the Plains Indians catching their first glimpse of the boats of the Corps of Discovery. This next painting, York, depicts an incident that occurred in the winter of 1804-05 at the Mandan villages on the Upper Missouri. The Mandans had never seen a black person before and were fascinated with York’s skin color, even at one point trying to rub it off. Of all the members of the Corps, the Indians particularly admired York for his unusual appearance and physical prowess. Charlie Russell often put the Indians, rather than Lewis and Clark, front and center in his depictions of the Corps. In this next painting, Russell depicts a cool morning in October 1805, when the exploring party encountered three canoes filled with local Pacific-Coast Indians who had come to check them out. This painting accurately depicts the Indian’s lightweight canoes decorated with animal heads, a description of which was recorded in William Clark’s journal. I have a large CM Russll painting removed from an uncles estate. It really appears to be an original and is dated 1896. How could i start the ball rolling on if it is an authentic and its possible worth. Thanks in advance for your help. i wonder how they verified the legitimacy of russells claim to have lived with the blood indians. i prefer thinking that he did. obviously, however, he must have spent a great deal of time around plains indians judging by his exquisite rendering of their artifacts and lifestyle. sometimes a little myth is more pleasurable than the so-called truth. Jack, did Russell claim to have actually lived with the Indians? He arrived very much at the tail end of the frontier era, and worked as a cow hand, but I don’t recall that he claimed to have done more than encountered and befriended Indians. He clearly had an amazing imagination to render scenes that were already past into such vivid life. My grandmother Mabel Cooper was a patron of Mr. Russell’s and bought several of his paintings when they lived in Great Falls. Four paintings hung in our home when I was a child but later disappeared when a relative pawned them without my mother’s knowledge. I still remember them, though.